Ah October- the month that brings a chill in the air and an urge to hibernate in front of an open fire with all your favourite comfort foods. Well, look no further! This cheesy vegetable crumble makes the most of a range of seasonal vegetables and it is perfect as a main meal or a side dish. Potato, carrot, swede, kale and leek are my vegetables of choice which gives a balanced between earthy flavours and sweetness which marry with the creamy cheesy sauce which is topped with crunchy crumble. 1. Prepare the vegetables by peeling them and cutting the swede, potatoes and carrots into cubes. Take a large, wide pan and place the cubed vegetables into it along with the vegetable stock and milk. Place two whole unpeeled garlic cloves in that have been pricked with a knife to infuse a delicate flavour. Bring to a boil before lowering to a simmer; cover the pan and simmer until the vegetables are tender to a knife point. Remember that swedes take longer than the other vegetables so keep the cubes of this smaller so they all cook at the same time. 2. Meanwhile, in a small pan sweat the leek with a splash of oil and small knob of butter. Cook until tender before removing and setting aside. Add the kale into the pan along with a splash of water; cover and allow to wilt slightly. 3. Preheat the oven to 200c/ 180 fan. Choose a large ovenproof baking dish that is large enough to fit all the vegetables in. When the vegetables are tender, take the pan off the heat and stir in the double cream along with some freshly grated parmesan cheese, the leeks and kale and mustard. Season to taste. Spoon half into the baking dish before crumbling some Caerphilly through before spooning the remaining vegetables on top followed by more crumbled cheese. Pour the creamy sauce over. 4. Finally, for the crumble topping simply place the flour in a large bowl along with the butter. Cut the butter into small chunks for ease and rub the flour and butter between your fingers to form a crumb. Grate in some parmesan if you like. Scatter the crumble over the vegetables and bake in the oven until golden and crunchy; this should take 30-40 minutes. Remove from the oven and allow to stand for a couple of minutes as it will be red hot! Serve as a main or as a side dish and dive in! 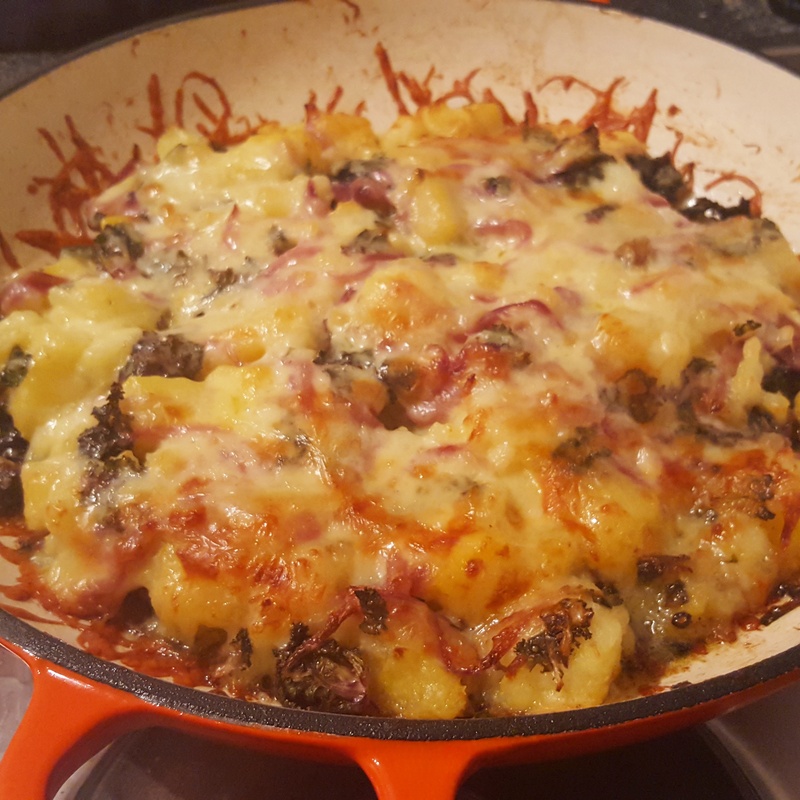 Cheesy vegetable crumble- a comforting autumnal meal that deserves to be centre stage on your dining table! I absolutely adore sea bream- firm yet tender, meaty yet delicate, it ticks all the boxes for flavour in my book. Fish is almost always best treated simply to let it shine without being taken over by the accompanying ingredients. I have teamed the bream with marsh samphire, which is now readily available. Samphire needs little done with it to add a wonderful saltiness; it can be steamed, roasted or pan fried to perfection. ‘Bacon as well as samphire? !’ I hear you cry! ‘Absolutely’ says I! Don’t think that the bacon and samphire will create a thirst inducing meal, it simply isn’t so. I used a lightly smoked back bacon which is tossed in with the potatoes at the last minute. If you like, consider replacing the bacon with other sea vegetables. Another word: Jersey Royal potatoes are currently in season in the UK and are simply wonderful so do use them whilst you get the opportunity. 1. Before you get cracking on the fish itself, boil a kettle of water and cook the potatoes. Most average sized new potatoes take around 15-20 minutes but this will also depend on the size. Test if they are cooked with a knife, drain well and set aside. 2. Meanwhile take two pans; one that is suitable for the fish so this needs to be a non- stick frying pan ideally and one that can be used for frying the bacon. Sea bream fillets will take around 5-6 minutes so I simply pan fry with 20g of butter (and a glug of oil if you like as well). Season the skin side of the fish with salt and pepper before frying skin side down for 3 minutes until golden. Flip the fish onto the other side and season before cooking for a further 2-3 minutes until cooked through. I used a spoon to baste the fish with the melted butter in the pan throughout the cooking. 3. At the same time this is all going on, heat a knob of butter in the second pan. Pop in the bacon pieces and samphire. Take the drained potatoes and lightly crush them with a masher or spoon before adding to the pan. Keep as much butter as you want (or need) to work its way through the potatoes. Now is not the time to worry about the diet! That can wait! When the bacon is crisped, the samphire soft and the potatoes warm, divide between two plates. Carefully remove the bream from the pan and place on top of the bed of potatoes. Serve immediately. Pan fried sea bream with bacon and samphire crushed potatoes- savour every bite of this wonderfully simple yet elegant dinner! Burns Night is just around the corner and this is perfect as part of your celebrations although there is no reason that this dish has to be confined to being eaten on only one day of the year. Think of a Scottish version of bubble and squeak and you’re on the right track. Rumbledethumps (its official name!) uses seasonal vegetables to create a moreish dish which can be served on the side of haggis (for the fans) or something along the lines of sausage. Traditionally rumbledethumps uses a mix of potato, swede and either kale or cabbage however with the rise of the mighty flower sprout I used this instead. 1. Get going by preheating the oven to 180c/ 160 fan. Prepare the swede and potatoes by peeling them and cutting them into large chunks. Bring a pan of boiling water up to the boil and cook the swede and potato until tender before draining well. I make sure the chunks of potato and swede are about the same size and boil them together but you could boil them separately in two lots if you prefer. 2. Shred the flower sprout leaves (or cabbage or kale). Melt the a knob of butter in a separate pan before adding the sprouts and onion to cook for a few minutes until softened. When they are ready simply set aside. 3. Take the drained swede and potato and lightly mash the chunks. You are after a rough mash so don’t overdo it! You will find that some potato pieces mash down a bit more than others and bits of swede will stay relatively chunky but that is exactly what you are after. Toss in the remaining butter and stir through. Next, stir in the sprouts before stirring to combine well and then season to taste. A good crack of black pepper doesn’t go amiss here! Place the vegetables in an overproof dish before topping with grated cheese, such as a cheddar. I cook mine in the same shallow casserole dish that I sautéed the sprouts and onion in; saves on washing up! 4. Cover the dish with a lid or foil and cook for 30 minutes before removing the cover and placing it back in the oven for a further 15 minutes, or until golden and bubbling. Serve with your choice of meat and tuck in! For those of you who indulge in haggis I have the perfect way to finish up any odds and ends… Crumble any leftovers into any leftover rumblethumps or a plain mashed potato and shape them to form potato cakes. Fry in a pan until golden and crispy and serve with a poached egg perched on top and a good dollop of tomato chutney. Chloedethumps- a modern twist on a delicious Scottish classic!